I started this blog back in 2011, mainly to remember a major trip to Oregon. 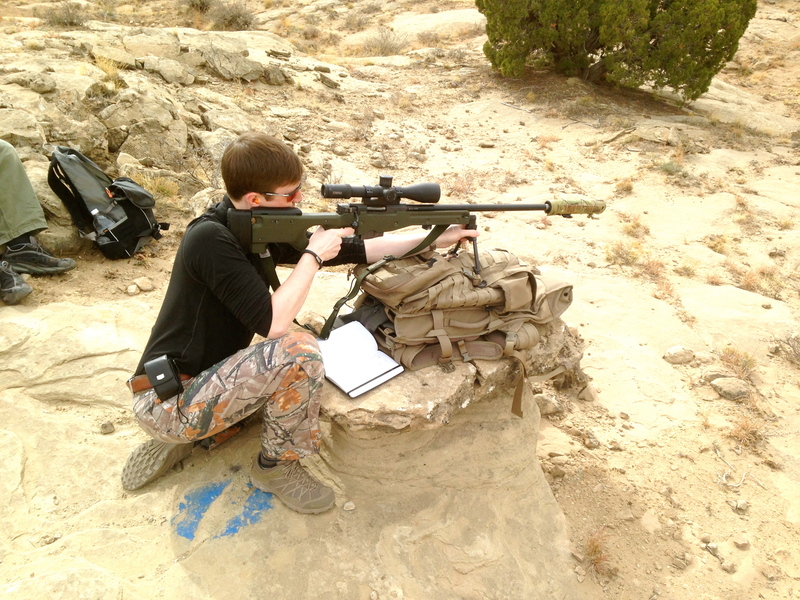 The pretense for the trip was Thunder Beast Arms’ Practical Field Rifle 101 Course. 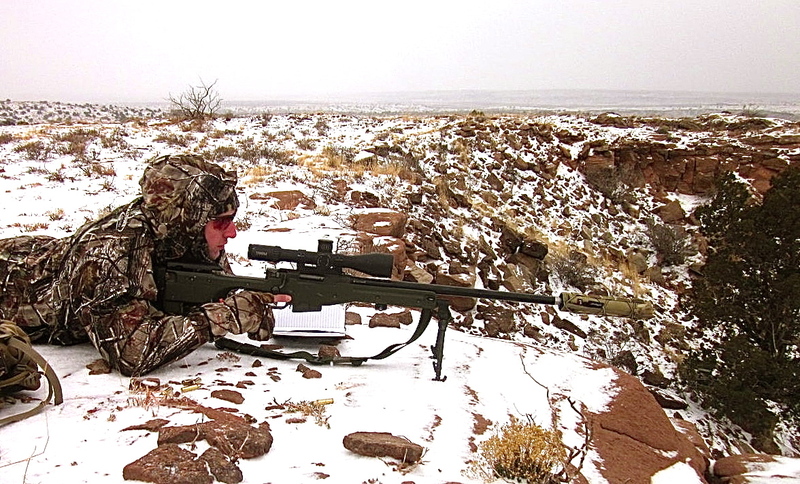 Basically, I signed up for three days of serious practical long range shooting. With a day on each end of the trip to travel to and from Elkton, I was looking at missing nearly a week of work. So I did the only rational thing, take an extra four days off to go blacktail deer and pheasant hunting. 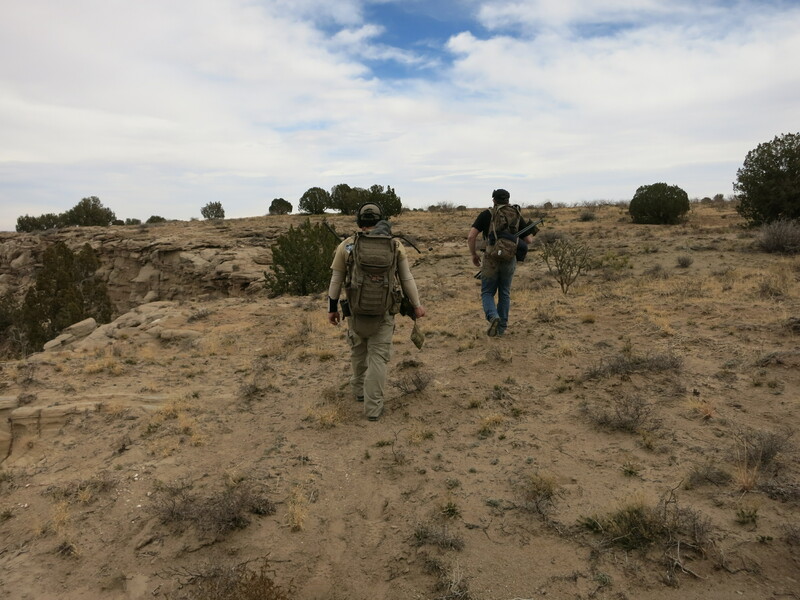 Sniper Adventure Challenge: a grueling 24 hour two-man team match featuring 30+ miles of hiking, long-range rifle, carbine, pistol, fieldcraft, lockpicking, and other challenges. 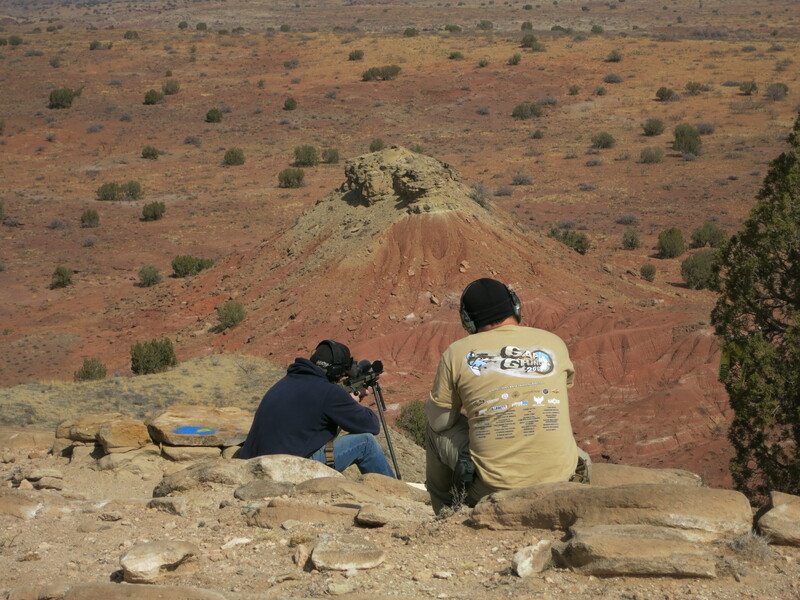 Sniper’s Hide Cup: in conjunction with Sniper’s Hide, a three day long-range/precision field rifle match with pistols, problems, and low-light shooting. 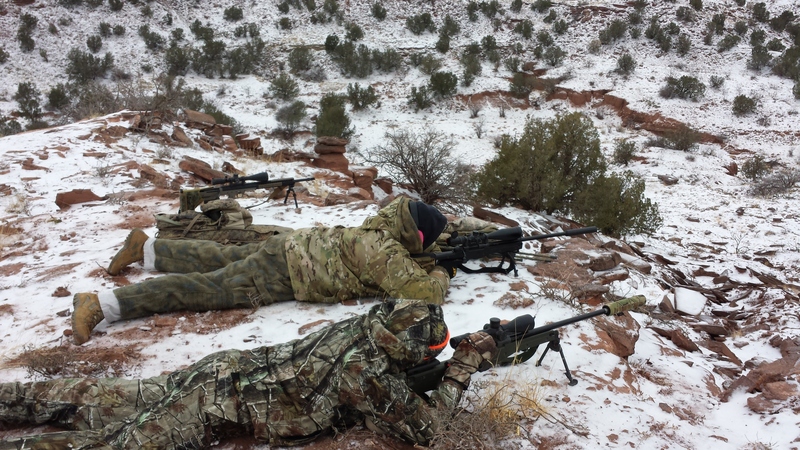 Thunder Beast Team Challenge: 3-day match, two team members, one with a long-range rifle and one with a carbine shooter. The matches have always sounded awesome, but the logistics have always appeared quite daunting, namely, procuring all the rifles, carbines, pistols, teammates, etc. Of the four, the Steel Safari sounded the most straightforward, only one rifle, no teammates. So when they opened registration for the 2014 Steel Safari back in January, I signed up the day registration opened. Given that the Steel Safari is one of the hardest matches from a pure marksmanship standpoint (shots out to 1200 yards), I figured I needed to get more practice. 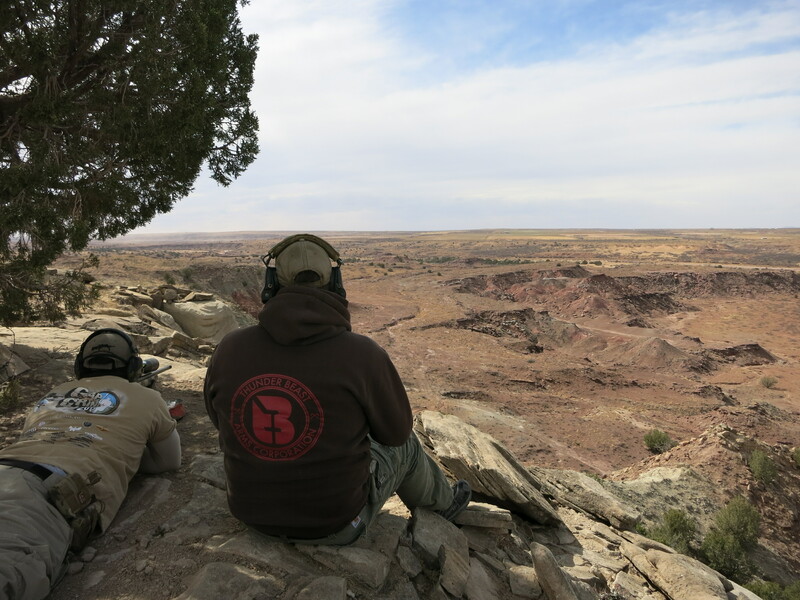 Luckily for me, a few weeks ago, I saw that TBAC had scheduled a two-day Practical Field Shooting Workshop at the Blue Steel Ranch. This would be the perfect opportunity to get some practice prior to the Steel Safari. So, I ordered a few hundred rounds of 175 gr 308 Federal Gold Medal Match and dusted off my laser rangefinder. 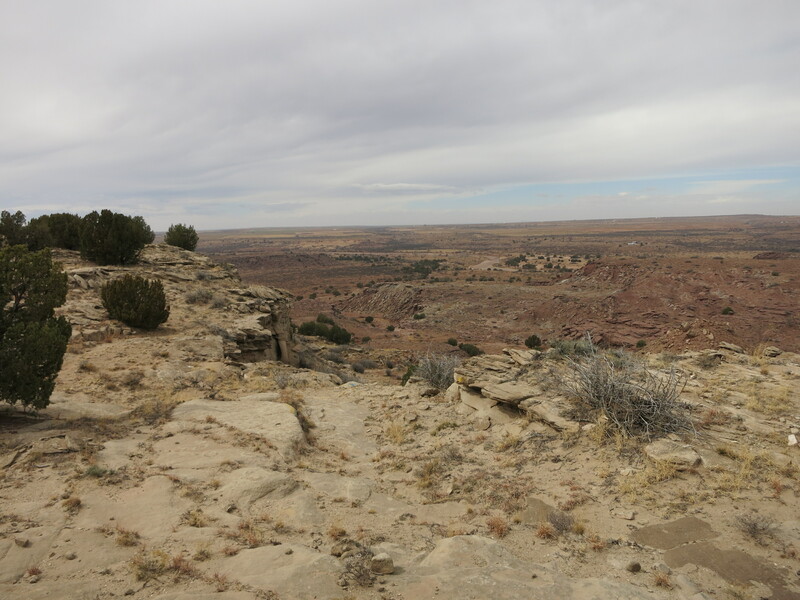 One aspect of field shooting that is very apparent when you look at the venues listed: OR, WY, CO, NM, etc., is that they are all west of the Mississippi River. The population density is simply too high east of the Mississippi to take 150,000 acres and designate them as a field shooting venue. Too bad for us city-slickers. Logan was sunny, ~40F, perfect conditions for long-range. The day started off with a quick check of our rifles’ zeros. The class consisted of me, three other experienced shooters, and our instructor, Zak Smith. I borrowed his trusty AI AW in 308 topped with a Steiner Military 3-12x rifle scope for the class. My rifle was almost dead-on. I’m pretty sure I covered it in my review of the 3-day rifle class but I’ll reiterate: once you shoot a full-bore rifle with a suppressor, you will never want to be around unsuppressed guns again. It truly spoils you. This particular specimen was the TBAC 30BA, an all titanium suppressor. 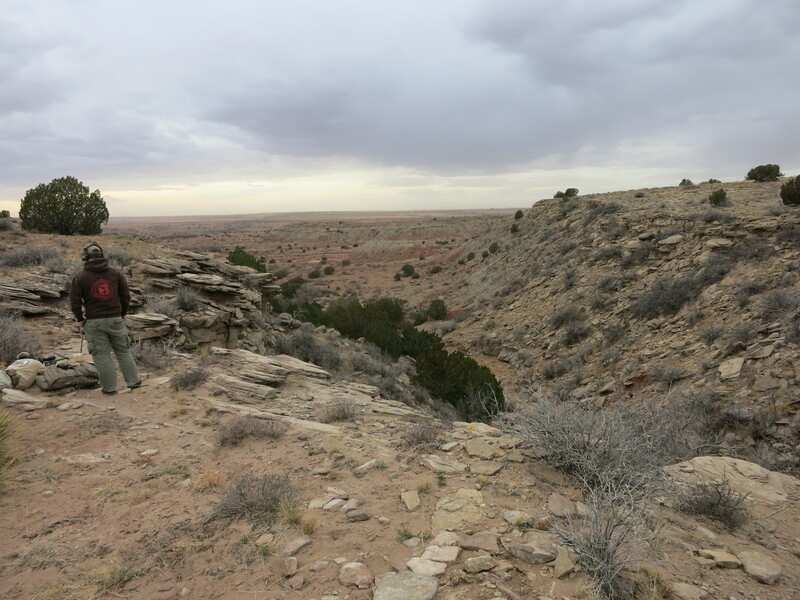 Afterwards, we loaded our packs with food, water, ammo, etc, and hiked about a mile to the first shooting station. This was a workshop, not a formal class, so we dove right into field shooting. Usually, at each station we would be able to see three to six targets. We would need to locate the reactive metal targets (diamonds, circles, or squares of varying sizes) placed 250-900 yards away. 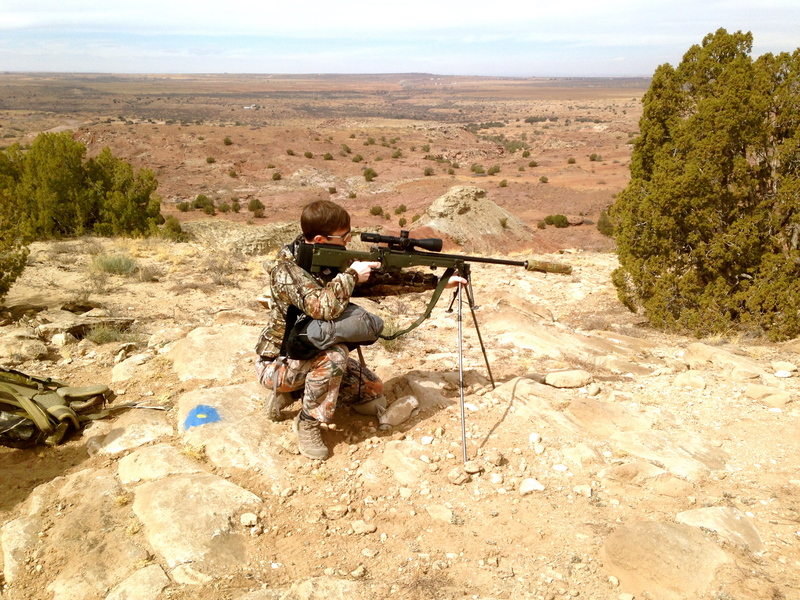 Then we would range them, prepare our data books, and get into position to shoot each target. Often there would be two stations, one from which we could shoot while prone, with another that required a more ‘interesting’ field position. 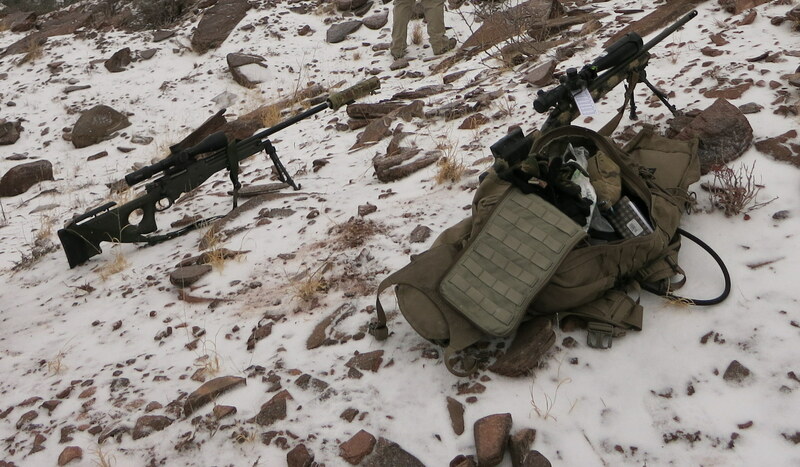 Slings, Shooting sticks, bipods, rucksacks, rear bags, etc, anything that could give additional stability was utilized. Besides prone, the two positions that I favored most frequently were shooting stick-supported sitting and shooting stick-supported reverse kneeling. Inside 400 yards, I had pretty good luck from those positions. Outside 400, I generally required prone to have the positional stability to make first round hits. That is not to say I got all first round hits! 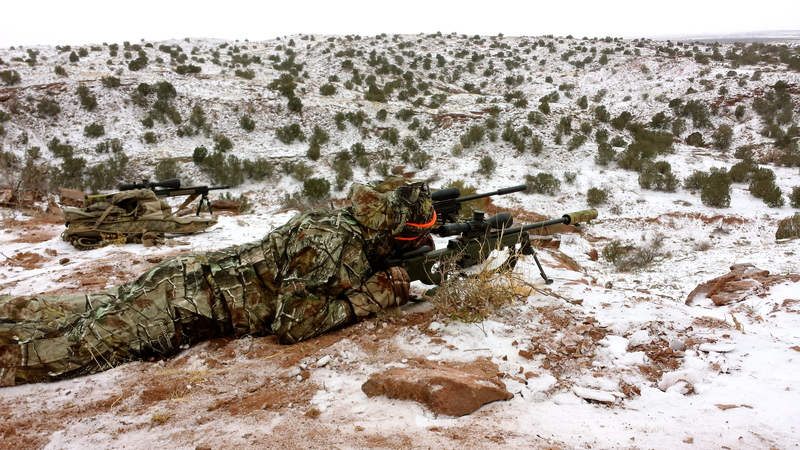 Wind is a serious challenge for the long-range marksman. 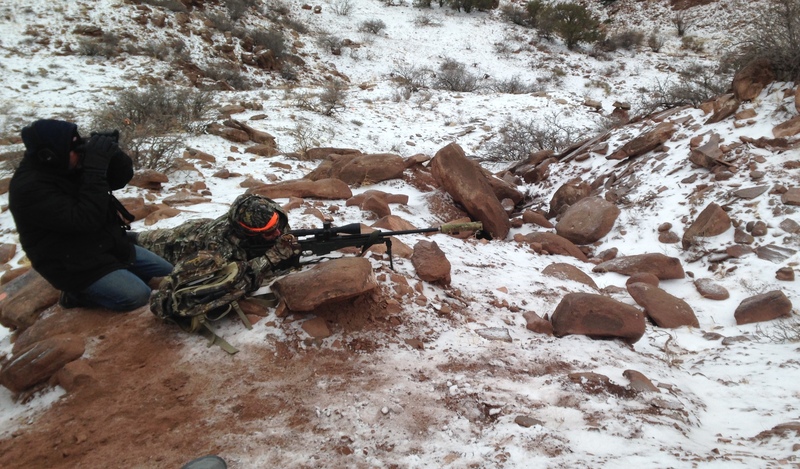 Small errors in wind estimation translate to big misses at 600+ yards, especially shooting 308, as I was. Here are some of the positions I tried. 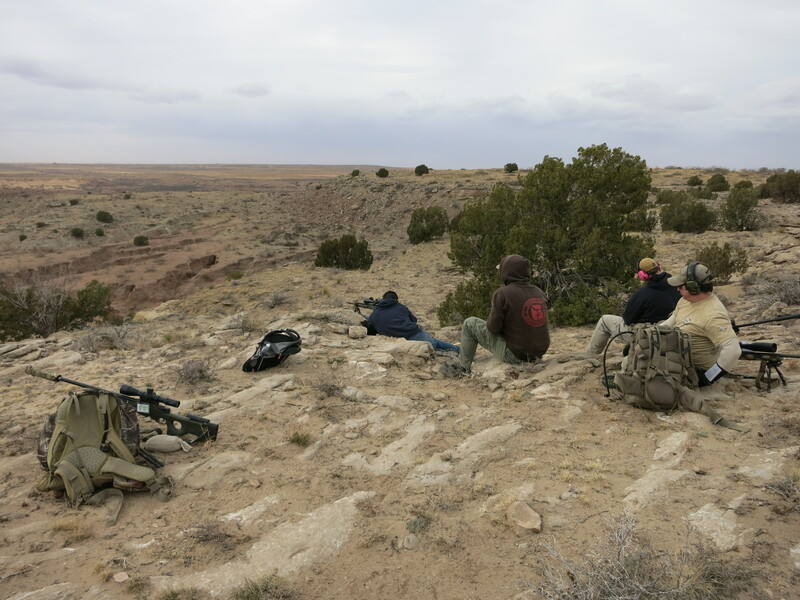 After a series of positions featuring different sizes, distances, shooting positions, etc, we broke for lunch. After lunch, the temperatures rose to the 60’s but the winds picked up notably. 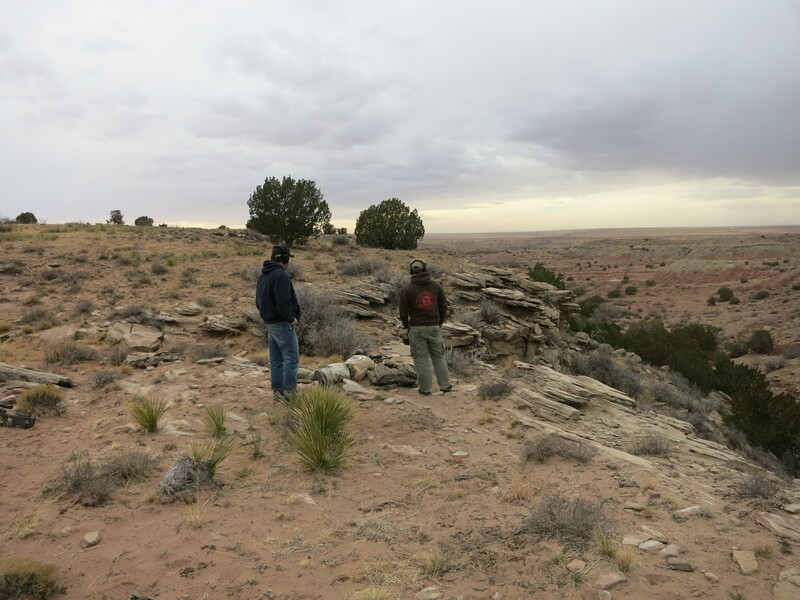 Soon we had massive gusts, and constantly shifting winds. It was an incredible challenge, even for the guys shooting 260. We had a shooter miss 3 feet right, make a wind correction, then miss 3 feet left, because during the time it took to cycle the bolt, the fishtailing wind had shifted again. Considering the circumstances, I was not overly disappointed with my shooting, but sending 5 rounds downrange without hearing the satisfying *clank* of contact with steel could be frustrating. Generally, we rotated at each station, with each person taking their turn while the others acted as spotters. Meanwhile, Zak gave us helpful pointers on position, tips on wind calls, and other strategies for quickly getting into stable positions. 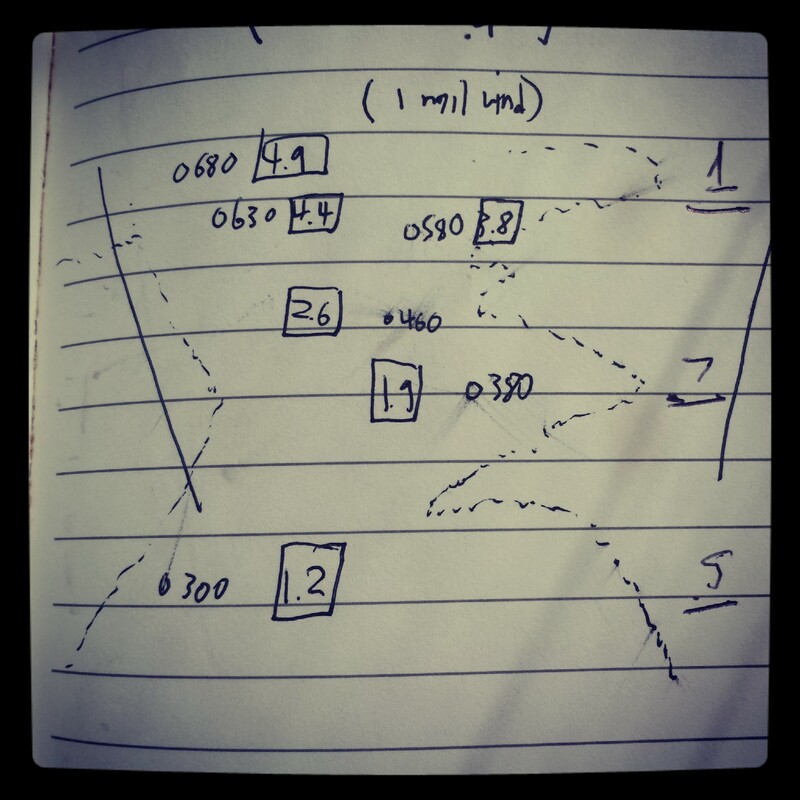 The dark black lines were my shooting lanes from left to right. 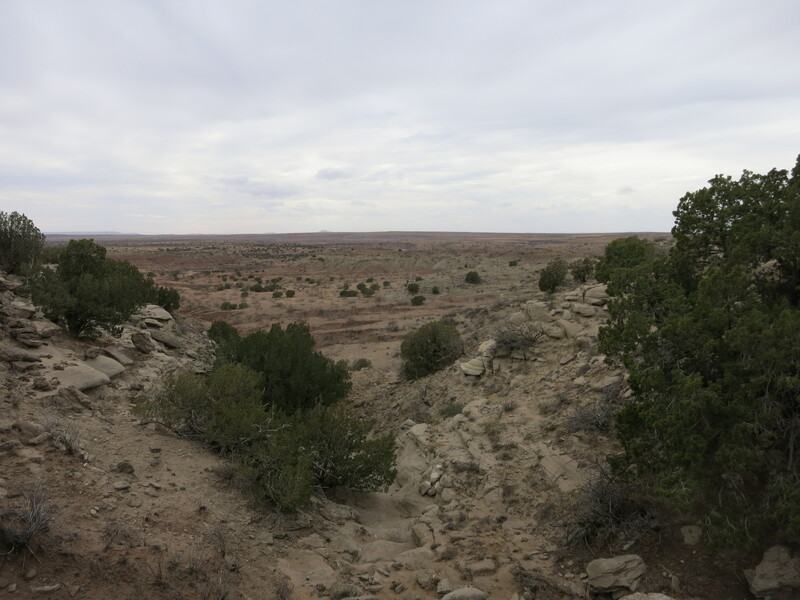 The dashes were a readily identifiable terrain feature like a ridgeline or cut. Each target was a small circle with the range next to it. The values inside the boxes were the elevation adjustments (in mils). The underlined values were the rough adjustment necessary for a “full value” wind. My proudest moment was when we were given 3 minutes to shoot 3 targets, ~300 yards, ~420 yards, and ~430 yards, then move about 10 yards, take up a position, and shoot the three targets again. I went 6 for 6, which made me very happy. I shot too quickly, ending up with about a minute to spare. Still, no complaints. 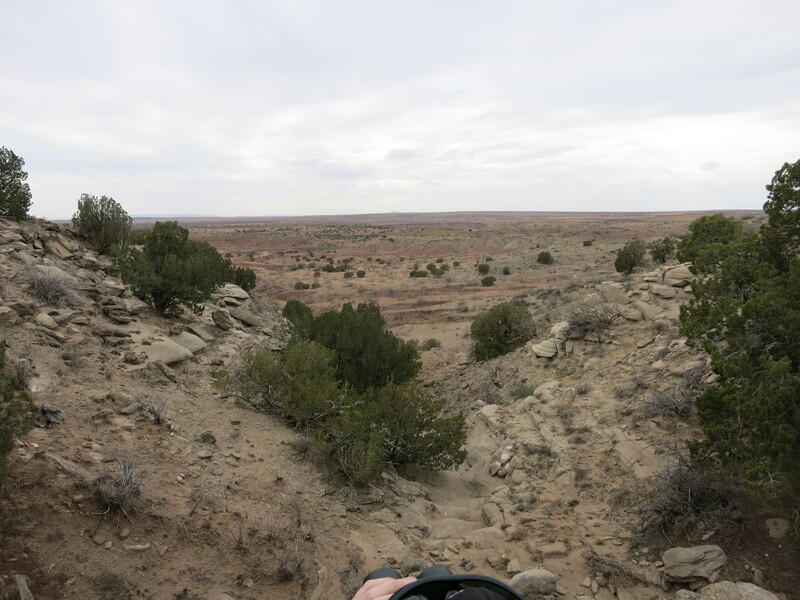 After our final stage, we walked to our respective cars and drove to Tucumcari, NM (a town that seriously resembles Radiator Springs from the movie Cars). Dinner was Mexican food at the Lizard Lounge, the food was pretty good for small-town Mexican. We mostly chatted about previous matches and the upcoming Steel Safari. After dinner, we retired to our motel rooms to get some rest before the final day of shooting. Amazingly, overnight the temperatures dropped from unseasonably warm to unseasonably cold. 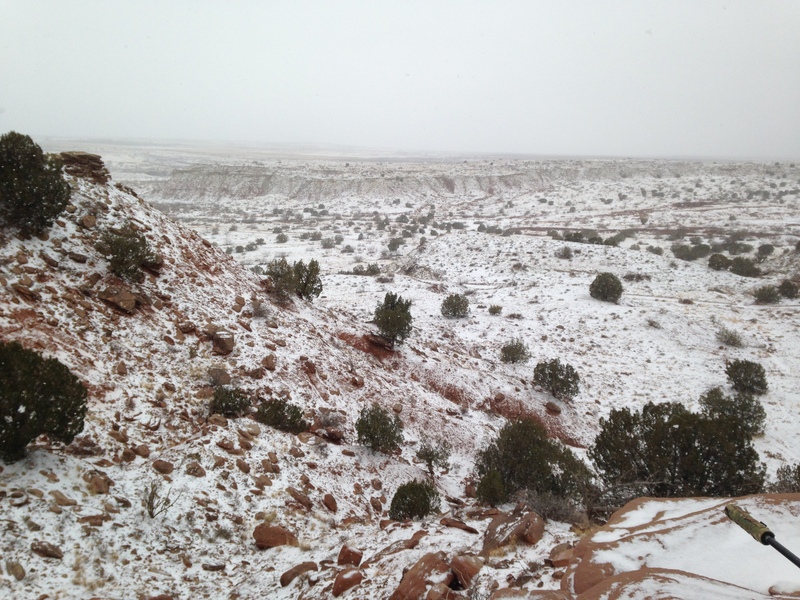 Everything was covered in an eighth-inch-thick layer of ice and air temperatures fell to 15F. Like other students, I had anticipated cold weather, but temperatures that cold make stationary activity outdoors pretty challenging. Jeans underneath camo overpants. Hothands and wool socks inside insulated boots. Merino base layer, Underarmor Coldgear, Sitka Long Sleeve, Microdown Vest, and a lightly insulated windbreaker/jacket. Sadly, I didn’t bring my bowhunting parka, as I simply couldn’t fit two jackets in my luggage. Despite this oversight, I stayed pretty warm. The biggest challenge was the cold weather’s effect on my fingers. I wore fingerless gloves with a mitten flap. During the time it took to load a magazine, range a few targets, and take notes, my fingers would get stiff and painful. Fortunately, I had Hothands in my mitten pouches and pockets so after a few minutes I could warm up. 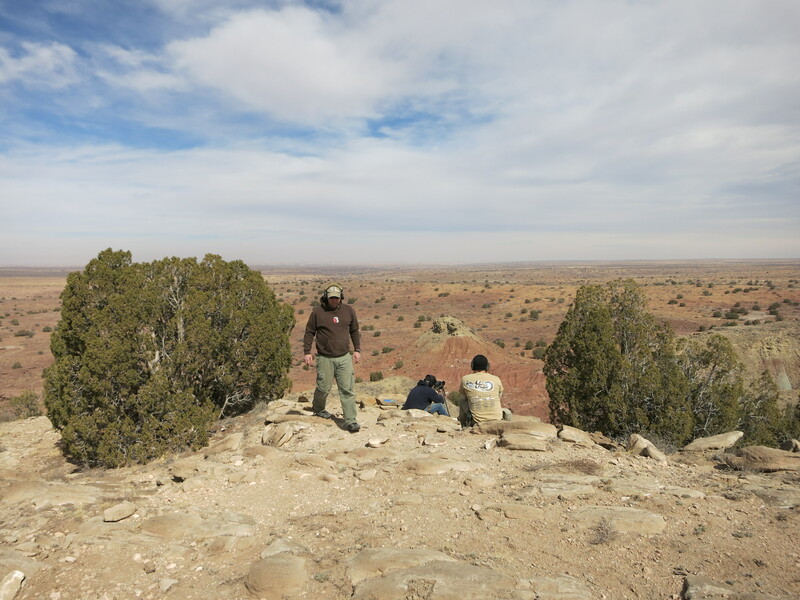 After the hike to the first shooting position, we started shooting at around 9am. Despite the frosty temperature, I thought the shooting was actually better on Sunday than Saturday for the following reason: somewhat stable wind speeds. On Sat. morning, the wind was nearly still, so I didn’t get much practice making wind calls. On Sat. afternoon, the wind speeds changed so quickly that it was almost impossible to use wind calls before the winds changed again. This resulted in a lack of feedback so essential to improving. Ideally, when you miss, you know exactly why: bad position, bad NPOA, bad wind call, bad range estimate, bad elevation correction, bad trigger control, etc. 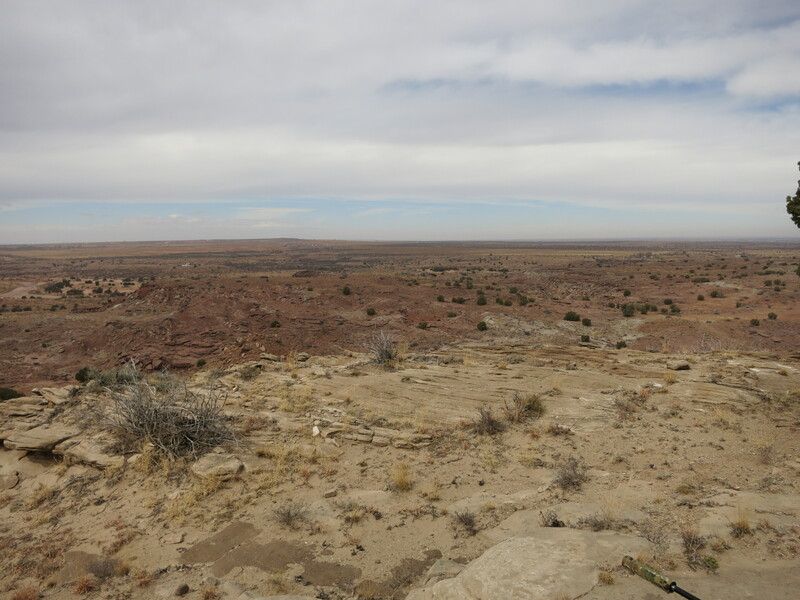 With rapidly changing crosswinds, it was very hard to know why I was missing. Most of Sunday, we had to make “full value” or greater corrections to hit the target. In TBAC terminology, a “full value” wind is equivalent to a 10 mph crosswind. With my loads, that varied from about 0.5 mil on close targets and about 1 mil on more distant targets. Of course, when the wind was really rocking, sometimes I’d need two mils to remain on target. 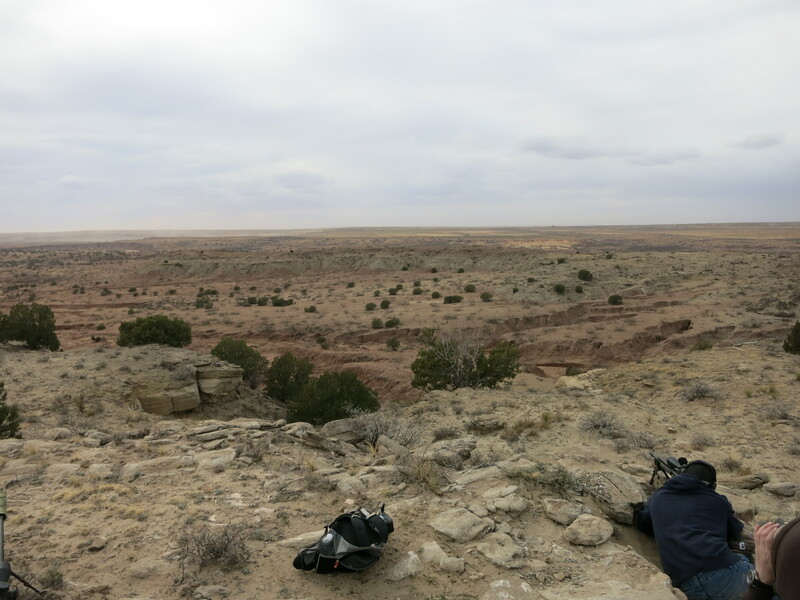 Also, on day two, we primarily shot simultaneously, rather than taking turns, so it was easier to “share notes” on wind calls. 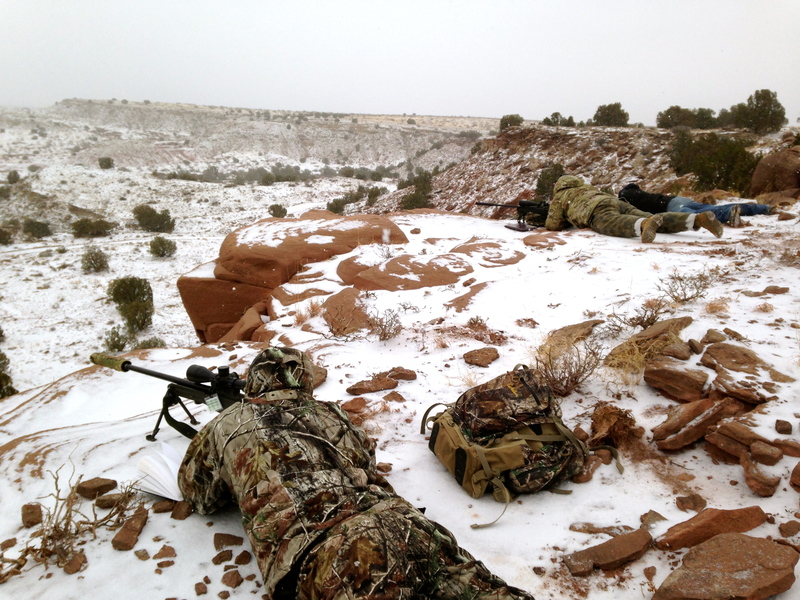 Given the temperature, shooting simultaneously meant less time standing around. On day one, my elevation dope was essentially spot on, almost all my misses were either due to bad wind calls or ‘shooter error’ (aka poor shooting). On day two, I was hitting low on distant targets. I consistently need one or two “clicks” up to hit targets further than 400 yards. 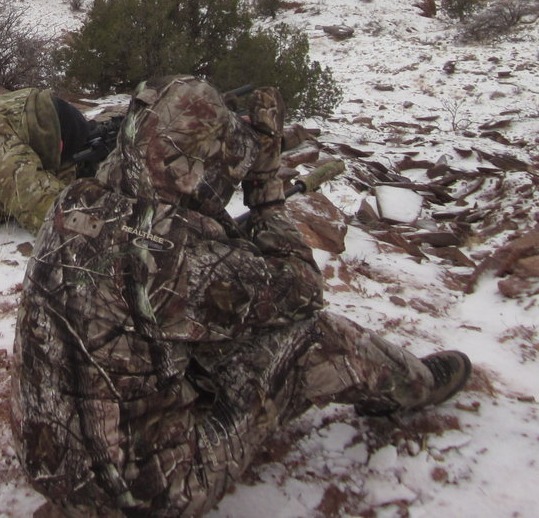 As more experienced shooters will know, calculating a basic drop table requires muzzle velocity and ballistic coefficient (BC). That basic table makes assumptions about scope height over bore, atmospheric pressure, temperature, and humidity. 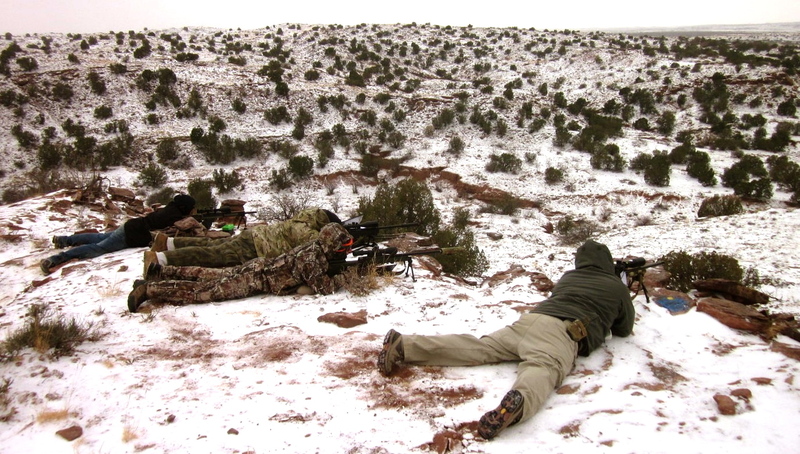 To simplify, serious shooters will often carry multiple dope tables corresponding to different density altitudes. Zak has written a good article on wind-meters that touches on density altitude and why shooters use it. Playing with a density altitude calculator, the drop in temperature from day one to day two resulted in a drop in density altitude from ~4300 ft to ~1600 ft. With a big increase in air density, the bullet experiences more drag, and thus hits low. This was the first time I’d experienced a noticeable effect from a change in weather conditions. 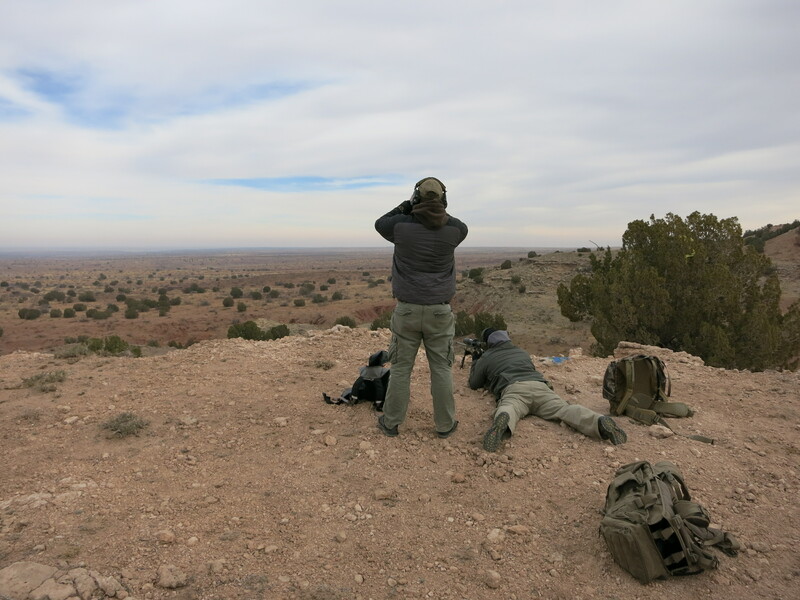 One of the more helpful techniques Zak taught was the ability to use corrections on close targets to estimate required wind correction on a more distant target. For example, at 240 yards, a 10 mph crosswind (a full value) produces a drift of about 0.4 mil or ~3″. If you centerhold an 6″ plate at 240 yards and you see the target twist violently to one side (indicating a hit close to the edge), you are probably at about a full value of wind. 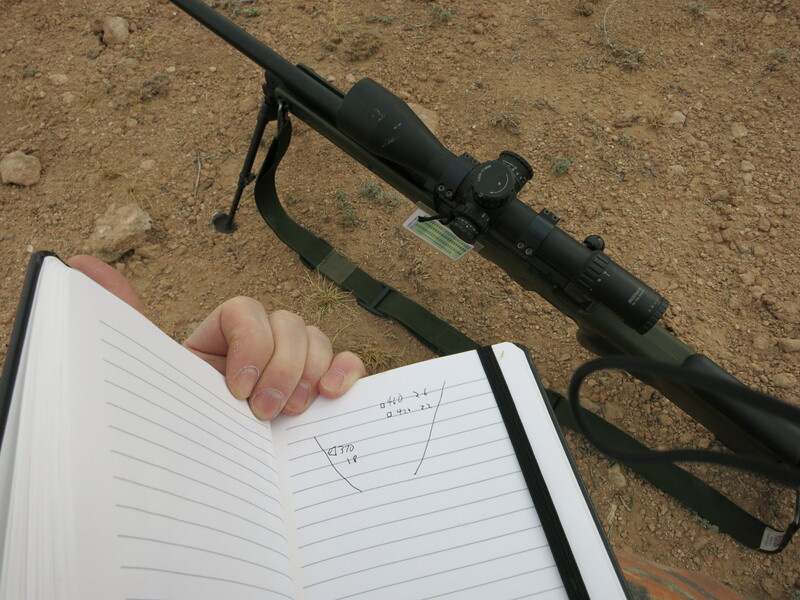 So if the next target is a 10″ plate at 520 yards, you would look at your dope card and find a value of 0.9 mil and so your initial wind adjustment would be 16″ or about one plate-width into the wind. Then, based on where the second shot hit, you could either add more or less wind on the 700 yard plate. 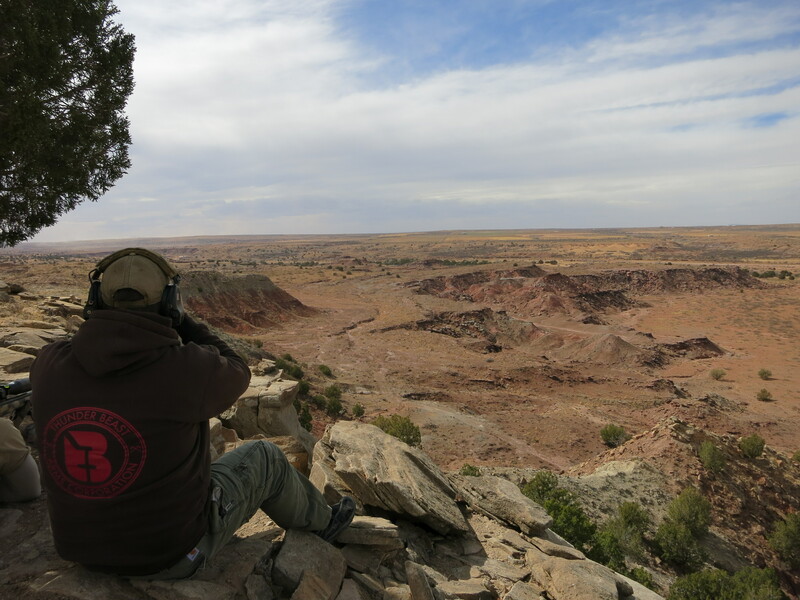 Note: this process obviously works best when the first plate is close enough to hit without a highly precise wind call, when you can readily spot your own shots (much easier with a suppressor and a moderate recoil cartridge like 260), and when the wind speed is somewhat constant. At around 11am, it started snowing, which was pretty neat. 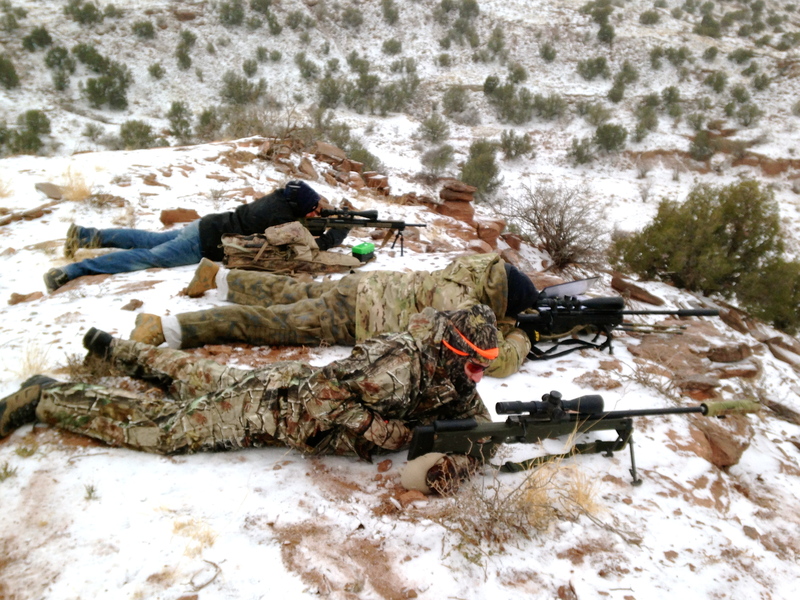 This class marked the first time that I hit a target more than 600 yards away in a snowstorm. Not quite sure when that skill will come in handy, but it was a cool experience. Despite the tough weather on Day 2, the other students and I greatly enjoyed the opportunity to get additional long-range practice. The rifles were a pretty standard mixture: two AI’s, one Desert Tactical, and one high-end custom bolt gun (probably GAP or Surgeon). 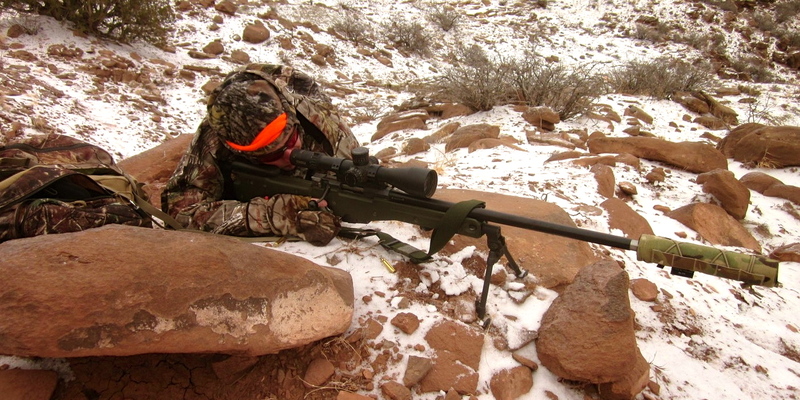 260 and 308 were the most common chamberings. 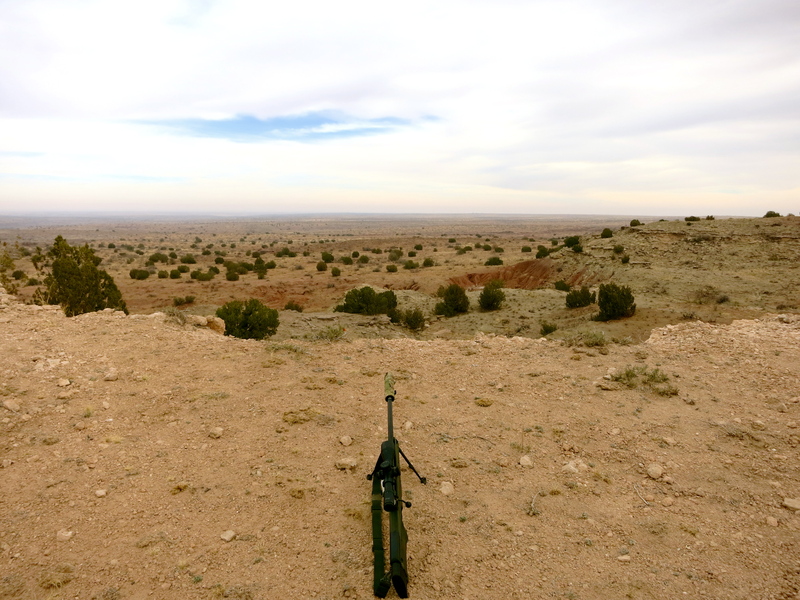 When I build my own long-range rifle, it’s almost certainly going to be 260 or 6.5 Creedmore, the advantage in the wind over 308 is very significant for a discipline like long-range. With two more days behind the trigger of an AI, how do I feel about the Steel Safari? I’m definitely more realistic about my chances. Going up against many of the best long range shooters in the country is going to be humbling. Placing well in the SS requires many disparate skills that can only be built through years of practice. 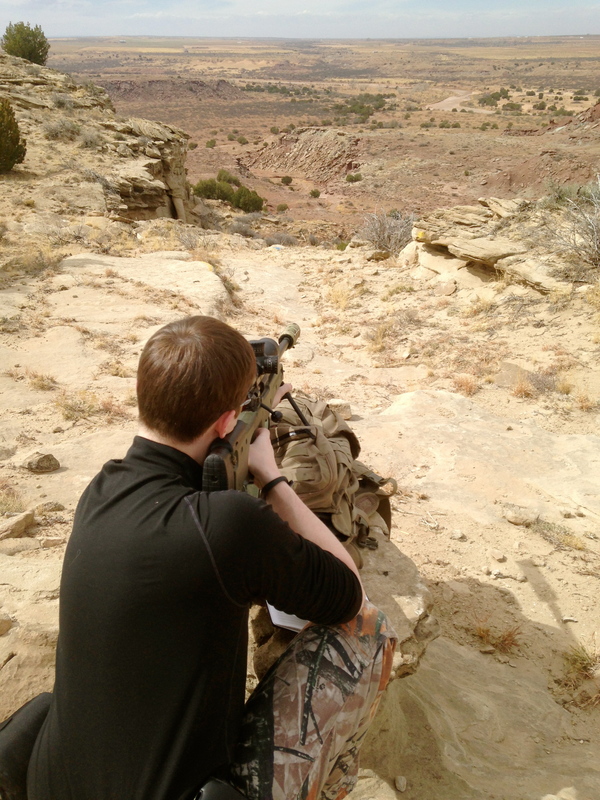 Take one simple task, getting into a shooting position. 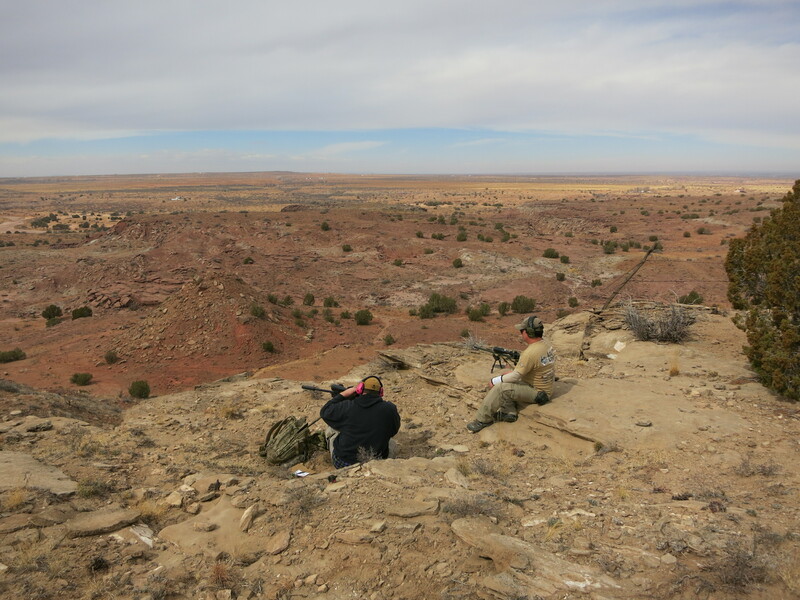 The freeform nature of the SS allows basically any shooting position but limited time, no sighters, and no “do overs.” Given the limited time, you must go to a station, rapidly assess the situation, and pick your shooting position. This highlights the tradeoff between time to deploy and stability of shooting position. I can take a snapshot from port arms in under a second, but I won’t be able to make a 500 yard shot. It could take me as long as a minute to get into a very stable supported sitting position if my target was an 8″ plate at 800 yards. Good shooters need to get in the most stable position attainable for all shots, at the risk of running out of time. Great shooters can get into a “good enough” position to make the easy shots, saving time that can be spent to create the most stability for the hard shots. Either way, I could use more practice getting into some of the more improvised positions (using shooting sticks, rucksacks, etc). Would I recommend the workshop? To almost all shooters, yes. Anyone who wants to be more proficient at long-range field shooting would get their money’s worth. That said, for a true novice, I would encourage them to start with a longer course like TBAC’s three day course that features a more complete introduction to the fundamentals.